Once again we can visualize what is primitive, hand-crafted and tectonic, without making us nostalgic, merely as a silent resistance to squander, frivolity and noise. Seventy kilometers to the north of Santiago lies the Valley of the Andes, one of the most beautiful and fertile areas in the Center of Chile. There, the Sanctuary of Teresa de los Andes is located, sprawled next to the Carmelite Monastery of Auco. It is here and at the foot of Mount Carmelo that the Capilla del Retiro was built, next door to the guest house where visitors can stay. It is visited by pilgrims, full of a desire for transcendence and in search of silence and recollection. 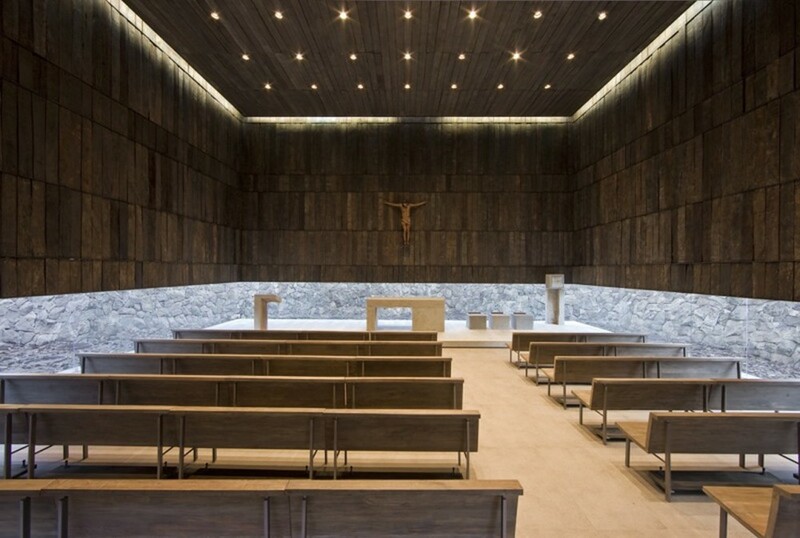 The chapel rises as a confirmation of the extraordinary geography that surrounds it, while respecting the axes established by the series of preexisting buildings. Concrete is the main material of the building’s structure. Its volume, strictly economical, rises up from a crosspiece of 4 beams in the shape of a cross that is supported with the least possible structural elements so that its relationship with the ground is slight but sufficient. Shape and structure here are an indissoluble synthesis. 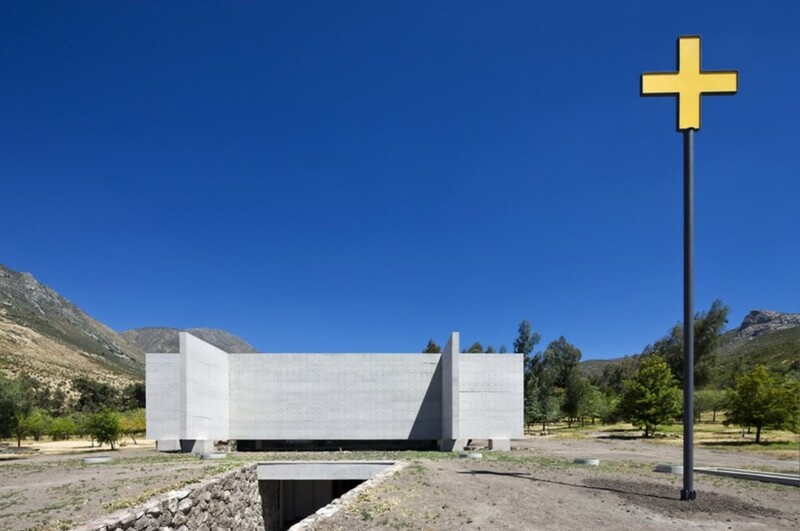 Under the strict geometry of the concrete a patio was excavated, whose rustic stone wall rises hazardously up and around the chapel, compressing and expanding that space of light. As a counterpoint to the magnitude of the geographic surroundings, the interior was designed in the shape of a wooden box recycled from old railway lines. This box hangs from the concrete structure and lies 2 meters under the beams that support it, limiting the view of the emptiness outside. The whole of this piece, which appears to levitate over the ground, refers us to the spiritual dimension inside. 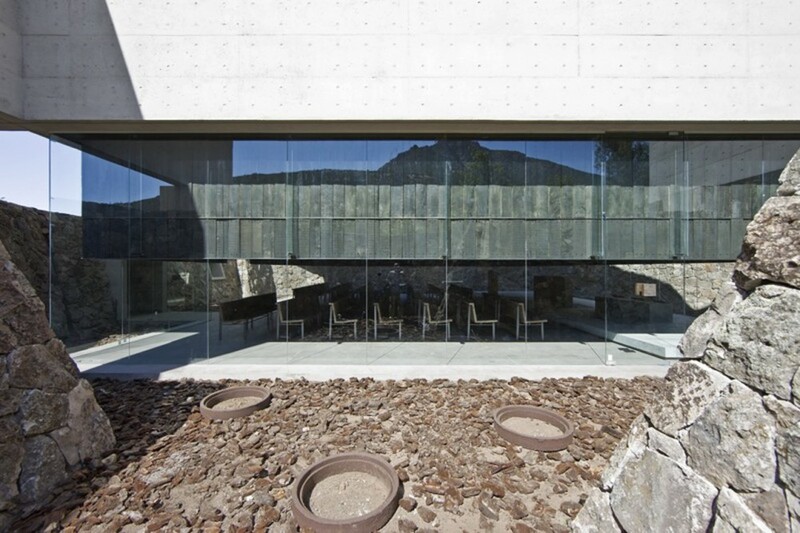 This space is illuminated from the lower part, leaving a space to view a weightless body in the interior that hides the rationality of its supports, whilst the exterior affords us a view of the stone wall that surrounds the patio. The upper light has been restricted so as to maintain a certain half-light in the box, which is heightened by the dark color of the wood. Here, the duality of the rational exterior / metaphysical interior, so typical of Gothic architecture, assumes a new expression of a commitment to modernity.